Peshawar (Friday, June 1st, 2018):- The National savings of Pakistan will declare the Prize Bond 40000 List 2018 in District Peshawar on dated 01 June 2018. 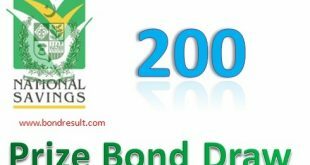 The is common draw serial Number 74 of Forty thousand Prize bond till so far in national saving prize bonds scheme history. The Rs. 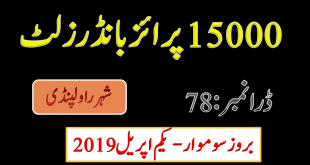 40000 Prize bond Peshawar Draw No.74 will held in morning time at 9:10 am with Live Kohenoor TV broadcasting to share the first and 2nd prize winning number in live on internet and cable. And the full third list will be assemblage further one and hence the 3rd prize winning number of Prize Bond 40000 01 June 2018 Peshawar will be updated at 5:30pm on Friday on this page. The National savings Rs 40000 Prize Bond latest Draw # 74 on Friday 01 June 2018 City Peshawar is going to be announced shortly for you. If you bought this highly cost and highly paid prize bond then you’re are also waiting for this draw No. 74 keenly. This is great news for you that media spokesperson of National savings of Pakistan have announced that there are great prizes waiting for you. The first category prize of the Prize bond 40000 draw 2018 is mouth watering amount that is 7.5 Cror Pkr but this is only on prize. The 2nd prize amount is 2.5 Cror pkr that will be given to three lucky winners. The third prize amount is Five Lac rupee that will be given to 1696 lucky winners. All the prizes are awesome and worth to attain in any way so only rush to get buy this big prize denomination today and get participate in this 74th draw held in Peshawar today. The previous draw of 40000 Prize bond Draw 2018 have also same amount of prizes and the first prize lucky number was 668593 who got the 750 M worth prize. The second winners numbes are 170191, 833081 and 644203 who got the 250 M rupee in second prize category. The are the luckiest person of that draws. 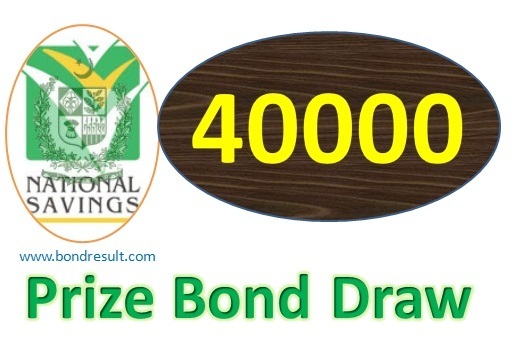 Rs 40000 denomination prize bond draw seized after every 3 calendar months which means that you can try your single prize number four times in a year and one time this bond may change your fortune. The Prize Bond Rs 40000 (Forty Thousand) is the first-class prize bond for business venture in you have extra money in cash or in banks. It is best because the draw have big amount of prize and the risk is zero for it because no change in money worth. Through this investment you may got high paid in days and get dream in real life executed. The prizes bond 40000 draw list June 2018 Peshawar is for you to have good worth in a day that can change your fortunes.